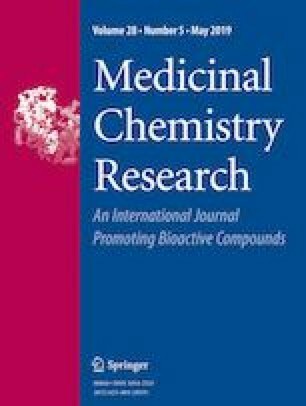 As pharmacophore hybridization has been used frequently in the discovery of new drugs, ursolic acid/glycyrrhetinic acid-uracil/thymine hybrids have been synthesized and evaluated their antiproliferative activity by the MTT assay. The results displayed that, the hybrids of glycyrrhetinic acid (7a–7b to 10a–10b) exhibited slightly better antiproliferative activity than that of ursolic acid hybrids (3a–3b to 6a–6b). Two single glycyrrhetinic acid-thymine hybrids (8a and 10a) possessed good antiproliferative activity against tested A549 cell line (IC50 = 10.7 and 18.3 µM, respectively). And three hybrids (3a, 5a, and 10b) exhibited about 80% inhibitory ratio against tested Hela cell line. The online version of this article ( https://doi.org/10.1007/s00044-019-02344-2) contains supplementary material, which is available to authorized users. This study was financially supported by grants from the National Natural Science Foundation of PRC (21562006), Guangxi Natural Science Foundation of China (2015GXNSFAA139186), Guangxi′s Medicine Talented Persons Small Highland Foundation (1506), Key Laboratory for the Chemistry and Molecular Engineering of Medicinal Resources (Guangxi Normal University), and Ministry of Educationof China (CMEMR2013-A01, CMEMR2013-C02).